And why must every start-up founder, business owner, or entrepreneur go do this right now? Back in 2011, this photo was one of the most viewed photos in the world—a photo so famous that it was reprinted by tens of thousands of media outlets in multiple languages all across the globe. What is it about this photo that makes it so newsworthy? Quite simply, it’s the context. If the media were covering the action alone (making out in public), no one would be interested. But because the action is framed in the context of the 2011 Vancouver riots, it’s incredibly newsworthy. Suddenly, everyone wants to know, "Why on earth were they making out there?" Context is what makes your product more newsworthy, media friendly, and shareable than it would otherwise be on its own. And creating this type of context is exactly what you’ve got to do when pitching the media. You don’t have to wait for someone else to create context for you. Be proactive. Create strategic context for yourself. Think about it: No matter how important you think your start-up, business, Kickstarter project, or product may be, to most media gatekeepers—who have a full inbox of pitches from other media hopefuls—you’re probably not discovering the proverbial "cure for cancer." It also works well when you’ve got to promote your start-up, Kickstarter campaign, or small business. Let's put this theory to use in a real-life PR Hacker campaign. When we first met the team at Klooff—the creators of a fun mobile app for pet lovers—we were impressed. The founding team was young, talented, and driven to succeed. We've built an iPhone app that anyone who has pets will love, but we don't have many users yet. Can you help us get some massive media coverage so people will actually download our app? It was a common start-up dilemma: In a crowded marketplace with many apps catering to the same niche, how can you stand out from the pack? Imagine that a journalist is on the receiving end of your email pitch. As he’s sifting through correspondence from 50 other companies, he gives your email a courtesy three-second look over. If at any point he thinks “I’ve seen it before” or “that other start-up is already doing this,” your e-mail is usually ignored. To make it through this three-second toll gate, you need a story idea—a suggestion for an article, column, segment, or blog post that engages a journalist more than just the average product press release. great features alone will not attract the media attention you need. Dreaming up a great story idea is never easy. That’s why we first brainstormed a strategic context around the Klooff pet app. We recognized early on that our context needed to be bigger than just "pets." Sure, pet-related stories are fun, but they have a limited audience: There just aren't that many pet-focused programs, publications, and blogs out there. Furthermore, general media outlets will only touch the topic on occasion. What if we could connect the niche market of "pets" to something that's covered even more by the world's top media outlets? We had an idea: What if we pitched the link between pets and "human relationships"? In particular, we knew that "romantic relationships" and "dating" are always water-cooler topics that do really well with audiences everywhere. Therefore, doing a “pet + romantic relationships + dating” story could help us go wider and reach significantly more potential Klooff users. your story idea has to be niche, too. With our strategic context in hand, we needed to come up with a specific story idea related to this context. Then, we could pitch that story idea to the media. In our initial Ideas Lab—the free-flowing brainstorm session that begins any PR Hacker campaign—we were reminded of those scenes in popular movies and advertising when a guy takes his dog to the park so that cute girls will approach him. But had anyone ever done a definitive survey or ranking on this topic? What if we could determine the best dog breeds for either guys or girls to attract a hot date? This was a novel and fun concept. And by packaging it up as a quantifiable ranking (something that brings order to an uncertain world), the media would love it. More importantly, the topic of doggie dating would provide an entertaining use case of the Klooff app. It would be easy to highlight the app's features as part of any segment, article or interview. Now that we had both a strategic context and a story idea, we set out to gather the necessary data. First, we put together a survey and distributed it to 1,000 men and women. We asked each respondent to rank the dog breeds that they would find most attractive in a potential date—as well as to describe what a person's choice of dog breed reveals about him or her in the romance department. As we created the survey, we also visualized how the media would run our story. Because we imagined articles with pictures of celebrities and their pets—think Paris Hilton with her color-coordinated Chihuahua—we designed a few follow-up questions with specific celebrity-friendly breeds in mind. 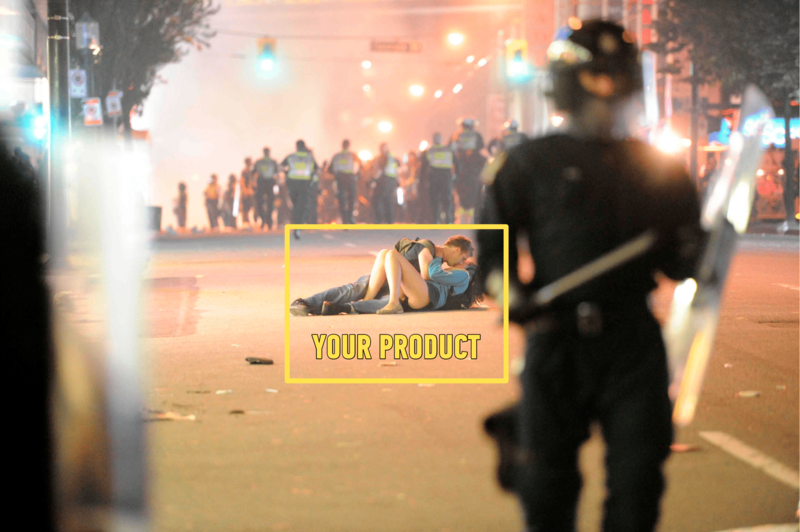 Visualize the potential media story and gather data that will give you the story you need. The results were interesting and entertaining. Men believed that women who had Chihuahuas were "hot" but "dumb." Women believed that men who had Pit Bulls were "tough" but "slimy." Men thought that women with Golden Retrievers were "sweet" and "wife material." Women perceived men with German Shepherds as good "father figures." The actual results didn't really matter much for Klooff: What mattered was that we had framed a discussion about pets in a way that had widespread potential media interest and universal appeal. 1. Build a custom media list and prepare to send personalized bulk email to contacts on the list. 2. Use a story idea pitch template that we've previously designed, refined, and A/B tested. 3. Customize the pitch template and create several variations of it (including different email subject lines). 4. 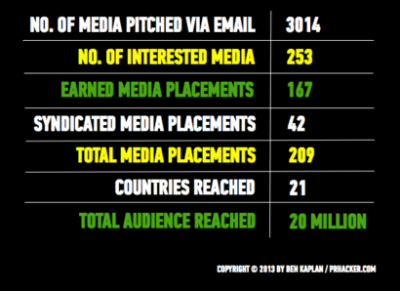 Email the various pitch version to one hundred or so smaller media outlets. 5. Using our data analysis worksheets, measure the conversion rate (those who respond with interest). 6. Choose a "winning" pitch and iterate on that pitch to make it even better. 7. Scale the winning pitch to larger media outlets and thousands more media contacts. For Klooff, this meant testing our "doggie dating" story idea on smaller media outlets—ones that specialize in stories on pets or relationships. It’s no secret that taking your furry friend for a walk is a great way to meet other singles. But what dog breeds give men and women the best chance of getting a “leg up” on "ruff" competition in the “dog eat dog” world of dating and romance? Next, we broadened the reach of our story by approaching general-interest media outlets. This second wave of outreach included morning TV shows, drive-time radio shows, daily newspapers, men's and women's magazines, lifestyle bloggers, and more. Test your story idea pitch on a smaller sample of media outlets and then go far and wide to a broader range of contacts. We knew we had viral PR potential when both large and small media outlets responded with high interest within minutes of receiving our pitch. Reporters, editors, and producers often would email us back with a chuckle and comments like, "this is so fun!" or "we love it." No matter who we pitched, everyone seemed to have an immediate and emotional response. And as well-known media outlets broadcasted segments and published articles about our story, we knew we'd get a high syndication factor—the rate at which other media outlets cover the same story because they saw it covered by someone else. If you get covered by influential media outlets, other media will report on the story without you having to pitch them directly. As we started seeing daily coverage of our story in countries around the world—places that hadn't been on our media contact list—we knew that our campaign had become a viral PR hit. In total, 200+ media outlets covered our story, reaching a global audience of more than 20 million people. Remarkably, the Klooff app was featured on all three of the top-rated national network morning shows in the U.S.
And Klooff received major traffic from popular women's portals. Top newspapers in the U.K. and Canada featured the app. And the story spread virally to 21 countries, including China, Japan, Russia, Serbia, Hungary, and more. That's why we believe that every start-up can develop strategic context, brainstorm creative story ideas, and use data-driven methods to get major media traction. That's why we believe we're all capable of being PR hackers. And we look forward to seeing you in the headlines.